Ed Wood, who sells sourdough cultures from various parts of the world, insists that a culture will maintain its unique combination of yeast and lactobacillus species and, thus, its unique growth characteristics and flavor, forever. My experience has been otherwise. I've bought his San Francisco Sourdough culture on two previous occasions. Both times, after a couple weeks of feeding, they produced bread with the characteristic San Francisco sourdough flavor, but after six months or so the flavor changed. The eventual culture was in no way "bad," it was just different. I assume the original organisms were replaced by others, and, from what I've read, the new ones derived from the flour with which I was feeding my culture. My understanding is that the yeast and bacteria which inhabit grains are mostly on the outer surface, that is the bran. I have fed my starters with a mixture of white flour, whole wheat and whole rye for some time. Also, I keep my starters at about 75% hydration. Dr. Wood does not address what kind of flour one should use for feeding starters, but he does recommend keeping the San Francisco culture as a liquid. I believe this favors the homofermentive (lactic acid producing) bacteria over the heterofermentive (lactic and acidic acid producing) bacteria which prefer a less liquid (and cooler) environment. With these considerations in mind, I have purchased Dr. Wood's San Francisco Sourdough starter a third time. I am feeding it only white flour. I still use whole grains in final levain builds, but I will not feed them to my "stock" cultures. It is now a month since I activated the SF SD culture. I've baked a few breads with it, but I made no special effort to bring out the distinctive SF SD flavor to date. The breads I baked were very tasty – among the best tasting I've made. The dough rose very well, indicating good yeast activity. The sourness has been mild. I figure it's time to start following the procedures I understand to optimize the culture for making breads with the authentic, distinctive San Francisco Sourdough flavor. The first goal is to generate a mature starter with good numbers of active yeast and lactobacilli. Second, to have this starter ferment at the hydration levels and temperatures that enhance the production of the “right” balance of lactic and acetic acid. Third, to mix and ferment a dough with the desired flavor balance. Incidentally, for this bake, I also incorporated Eric's (ehanner) recently endorsed addition of a small amount of Durum flour to a white flour mix to enhance flavor. Make the penultimate levain by dissolving the firm starter in the water and mixing in the flour. Ferment at room temperature until it is actively bubbling but not foaming. (8-10 hrs) I mixed this early one morning and let it ferment while I was at work. Make the ultimate levin by dissolving the penultimate levain in the water and mixing in the flour. Ferment at room temperature for 2-3 hours, then at 78-85ºF for another 10-12 hours. I mixed this after dinner and placed it in a warmed microwave oven over night. In the morning, I refrigerated it while I was at work. Add the salt and mix thoroughly. Knead by french folding or in a stand mixer until the gluten is moderately developed. If using a KitchenAid mixer, this dough will not completely clean the sides of the mixer. With the flours I used, this was a moderately slack and somewhat sticky dough, even though the hydration was actually lower than what I most often use for sourdough breads these days. I assume this was because I have generally been using about 10% whole wheat or whole rye flour, which absorbs more water. Transfer the dough to a large bowl and cover it tightly. Note the volume of the dough. After 20 minutes, “stretch and fold in the bowl” for 30 strokes. Cover tightly. Repeat Step 6. two more times. After the third “stretch and fold in the bowl,” let the dough rest for another 20 minutes, then transfer it to a lightly floured board and do a stretch and fold (“letter fold”). Return the dough to the bowl. After 45 minutes, do a second stretch and fold on the board. Return the dough to the bowl. Cover tightly. Continue fermenting until the dough has doubled in volume from the original volume that you noted in Step 5. Transfer the dough to the board. Divide it into two equal pieces, and pre-form each piece into a round (if making boules) or log (if making bâtards). Cover the pieces and let them rest for 10-20 minutes to relax the gluten. Form your loaves and transfer them to bannetons. Cover with plasti-crap or place each banneton in a food-grade plastic bag. One hour before baking, preheat your oven to 500ºF with a baking stone and your steaming method of choice in place. Transfer the loaves to your peel. Score the loaves. Transfer the loaves to the baking stone. As anticipated, the loaves spread some when transferred to the peel and spread more when scored. Steam the oven and turn the temperature down to 460ºF. After 12 minutes, remove your steaming source. (If it is already dry, you can leave it in place, but do open the oven door for 10-20 seconds to vent the steam. Leave the loaves in the turned off oven with the door ajar for 7-10 minutes to dry the crust. Transfer the loaves to a cooling rack. The crust is very crisp and crackly. The crumb is moist, tender and quite full of lovely holes. The flavor is sweet and "clean" with no perceptible sourness. This is a wonderfully tasting bread, but the absence of any sour flavor is a mystery. 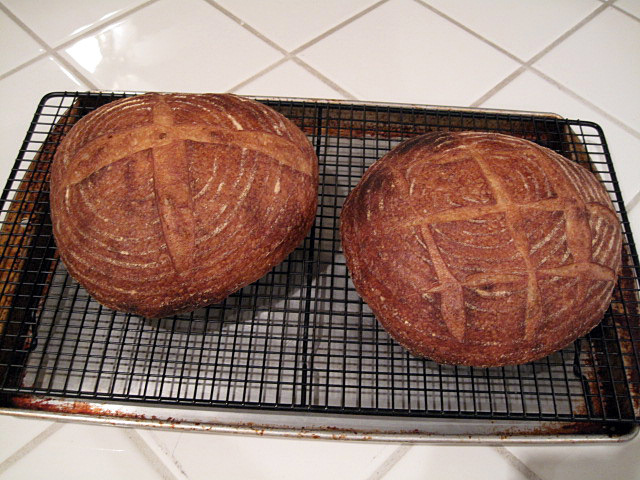 My next experiment needs to be to bake the "San Francisco Sourdough" from Reinhart's "Crust&Crumb." If that is not sour, the lactobacilli must have missed the plane from Idaho! With loaves like that, this is bound to be a success! I think you will like the crumb. The taste is delicious, but not at all what I hoped for and expected. The plot thickens, doesn't it? For someone who doesn't own C&C: How does that SF SD deviate from the one you described here? If I'm not mistaken, there is a SF SD also in ABAP - have you tried that one? If "KAF european style flour"
If "KAF european style flour" is like mine, this 72% (final) hydration dough is a ciabatta! The bread works well with cheese. Honey would be chancey. The SF SD in C&C uses a large proportion of firm starter that has been cold retarded for at least 12 hours and up to 3 days. Then, the formed loaves are retarded too. You are correct regarding the typical SF SD crumb. 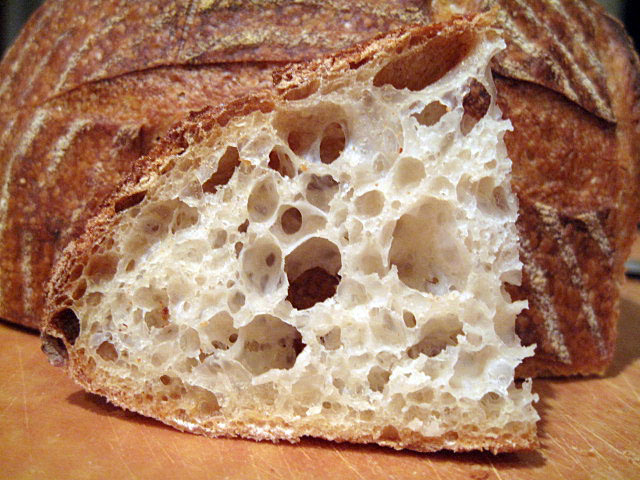 Here's a fair example: I'm nuts about San Francisco Sourdough from "Crust&Crumb." I haven't gotten around to tying Suas' SF SD. It's not very different from Reinhart's. I have the same "problem" and it obsess me. This is my experience: in the last year I did a lot of experiments with sourdough and flavor and yes, it's a mystery for me also. First, I chose a lean bread (ie formula+process+ingredients): a classic Pain au Levain. I tested the result changing only one variable: the sourdough culture (3 culture I started, 1 from Oregon, 1 from Utah). So I had the same process, the same ingredients, the same meticulous (obsessed mad) baker. I didn't found any big or interesting differences. I also tasted the Hamelman white sourdough culture (during a baking class in Norwich) and it was not so different respect to my culture. It's interesting you had the characteristic San Francisco sourdough flavor for a few month ... I'm envious. The most interesting differences I found is related to the variables: ingredients (flour ie. ash content, malt) and process. Sourdough is still a mystery to me. i think maintaining the original sourdough organisms is too difficult in a home or bakery setting. the environment in which the cullture is stored, tools that come into contact with the culture, air, humidity, etc...bring in too many variables to keep the original culture pure. i think once the lid comes off of the container, new yeasts are already making its way into the home. after a few generations, the original culture will eventually become new. well, thats from what i have learned recently and from experience. It's hard to feel sorry for you when the bread looks that good. I hope you were able to taste the Durum in the mix. I think it adds a definite buttery deeper flavor. Are you keeping your starter at room temp continuously? If I recall, when I fed my starters at 100% hydration, twice a day on bread flour for a couple weeks was when I first was able to improve the sour in my breads. I do think that feeding once in 24 hours results in them being worn out or exhausted for some time. I usually reach peak yeast activity in 4-6 hours and the dome collapses around 8-10 hours. Once the culture becomes stable in those living and feeding conditions, the acid balance seems to favor a more sour taste. Once I have that balance established I can start feeding a dryer ratio of say 1:3:4. The dryer ratio I think provides more food over a longer time and for me anyway, works better for getting a stronger sour and a nice open crumb. That said, I have never been able to make a loaf I thought was too sour. Interesting work you are doing here David. I sometimes think I should wear a pointy hat and carry a wand when doing these SD experiments. To date, my work and travel schedule has not permitted twice a day starter feeding, but I'll try this over the next few days. I fed the starter with my customary mix of AP:WW:Rye (70:20:10) this morning and made it a bit drier. I'll feed it again this evening and mix a firm starter tomorrow morning to ferment during the day and retard over tomorrow night. I'm thinking that the WW and Rye should help the lactobaccili get in gear. If I thought it would help, I'd wear a pointy hat, feather headdress or a beanie with a propeller on top! Last year, I stopped putting the starter in water to dissolve. I believe that doing so is too much of an environmental shock to the bacteria (osmotic shock) and may be killing too many of them. The yeast don't seem to be affected at all by this sudden change in hydration, and that's why the bread rises normally. You might want to mix the water and flour for your levain first, and then add the starter. That way, the hydration is similar for the bacteria colonies as they're introduced into the levain. Interesting hypothesis regarding osmotic shock killing the LB, but I'm not so sure. I began mixing the starter with water before adding flour based on Daniel Leader's methods in "Local Breads." I've never done a side-by-side comparison. Maybe Debra Wink or another bacteriologist will wander by and offer an opinion on the subject. Visually those loaves look great - I'm sorry you didn't get the sour you were hoping for. If it's any consolation, I've been spending the last 2 weeks also working on 3 build levains - made considerably harder by falling ambient temperatures -it's not summer anymore, I guess. While my builds were different to yours, I also tried to implement a system to get a good balance of acetic, lactic and yeast. Like you, I also retarded the final dough for about 16 hours. The final result was also surprisingly mild. Particularly suprising because along the way, the aroma from the dough (and the taste - yes I'm an occasional dough eater!) seemed in keeping with the desired 'acid profile' for each stage. I'm wondering if cold retardation in this case may have been a factor in the final flavour? The bread tastes great too, just not sour. The cold retardation prolongs the fermentation and should enhance the flavor generally, but supposedly it also encourages acetic acid production, as I understand it and have experienced in the past. So, why didn't it work? Are there not enough lactobaccili in the culture? I would think that, with 3 builds the beasties should have had plenty opportunity to reproduce. Does my culture have the wrong species of bacteria predominating? I have no way of testing this? Is the starter just "maturing" slowly? Time will tell. I don't get it, the recipe puzzles me. Why go thru step 2 to make 550g starter only to take 200g of it for the final dough? Then in the ultimate step, the starter is just held alive with 1:0.6:0.6 for a long ferment 12-15 hours then refrigerated. This is to encourage a large amount of LABs? I was under the impression that enough flour has to be mixed into the starter to lower acidity thus triggering LABs to multiply and work on raising the acid levels. They slow down production as the acid level increases and stop at their ideal pH. So I think that by keeping a high acid level in the build, the LABs are not increasing in number but getting "lazy." Their numbers drop off, they are preserved but they are not reproducing. When the LABs are finally fed in the final dough, their numbers just can't raise the acid level in the time span that the Yeast is working raising the dough. So they are baked before the acid levels reach levels that we can taste. Solution: I think you need more room temp hours before the dough is retarded in the fridge to make this work OR forget step #2. Or add almost all of the 550g starter and reduce the water in the dough. I also wondered why such a large build is required? We were discussing the pH level, LAB count and acidity in another thread as well. In short, it has been found that a starter that's inoculated at 50% (or higher), the pH was consistently too low for any lact. sanfrancisco to appear. Yeasts are not that sensitive to pH levels, and will still thrive, but the high inoculation/large amount of stock starter used in the first step might just slow down/inhibit LAB from growing. If you look at the overall sourdough formula, David is using a 100% flour/100% water/20% starter. To me, that sounds like an ideal formulation. But breaking it down into two separate builds might be counterproductive with respect to LABs, as Mini suggested? On another note, Hamelman in "Bread", advocates a two-step build in the levain chapter of his book. His reasoning is more intuitive than scientific, however. On a final note, many who bake rye breads comment that a 3-step sourdough build produces a very aromatic and well balanced flavour that is generally less sour than a straight 1-step build. Hmmmm .... In my method, I was descriptive not prescriptive. I was stingy with the second feeding because I didn't want to build too large a volume of starter. I built more than I needed, planning to use the excess for other breads. I was under the impression that a feeding that doubled the starter volume was adequate nutritionally for the yeast and LAB. Regarding pH: I thought that too low a pH inhibited yeast. I didn't know (or forgot) that it inhibited LAB. Is that right? Do I have it bass ackwards? Well, it depends on what kind of LABs. In a SF SD, lact. sanfrancisco is dominant, and from what I've read, lact. sanfrancisco thrives best in a pH environment between 5.0 - 5.5. That's a pretty high pH in sourdoughs. To get that kind of levels a 5 - 20% inoculation is recommended, according to Dr. Gaenzle (contributor to The Bread Builders). The high inoculation level of your first build, might just prevent lact. sanfrancisco from becoming dominant? In another thread, where we were discussing starter maintenance and the TFL handbook, some of these points were brought up. Click here for that! Edit: Dan Wing, one of the authors of The Bread Builders, had a long correspondence with Dr. Gaenzle during the writing of the book. Much of this was edited and put into the very back of that book. More interesting details about lact. sanfrancisco, the origin of LABs etc. from his communcation with Dr. Gaenzle can be found here. it seems both may be affected when acid is too high (or the pH is too low). A lot has to do with the flour's buffering capacity or ash. I find it easier to care for the LABs and the yeasts will take care of themselves. Seems yeasts are more affected by temp than LABs and LABs are more affected by pH. When I observe a starter coming out of cold storage, the culture seems thick with LABs and the yeasts need pepping up, thus feeding(s) on the counter at room temp. Important is to feed enough flour per feeding to stimulate the LABs without giving too much food and diluting or neutralizing the starter acid too much (forcing pH levels too high.) These can vary from location to location. Experimentation soon reveals the proper amout of water and flour that works within a specific time period and temp. to maintain the starter. I think the pH of my water is Korea is lower than that of Austria, using about the same amount of water, I seem to mix my starter thicker here. I would not be surprised if the pH of maintaining San Fran LABs would vary throughout the country depending on the water pH. What works in San Fran to their water pH might not work elsewhere so easily. Maybe more flour is needed to raise the pH or less to lower it to benefit the LABs. Since you want to be so scientific about this.... I've never really tested flour for pH but I'm guessing they are alkaline. Maintaining the dominance of "original organisms"
Hi David, those are beautiful loaves and that crumb is quite impressive. I'm not a biologist. But the suggestion that native bacteria eventually overtake those found in an ordered sourdough culture makes sense. Maybe this process could be slowed by cooking the flour used to feed a starter. I think it is 19X*F that ends all biological activity. It also changes the sugars and structural aspects of the flour. But, for the amount of a culture used to make bread, it shouldn't change the final loaf. Maybe just the feeding schedule of the starter. David, Susan and I tried following the feeding ratio suggested by Leader a while back. The idea was to use a mix of AP:WW:Rye similar to what you do. I abandoned the test because the activity was so intense that my starters needed twice daily feeding at a hydration of 1:3:4. If I didn't get to the feeding on time the culture was flat and starting to decay into hooch. Now, I only occasionally add a pinch of rye or ww if I'm trying to rev up the starter culture after a prolonged refrigeration. I'm not a biologist and have tried to grasp this sour concept from the standpoint of a layman baker. Debra Wink I believe has made the case that we need to control the environment to favor the type of biology we want to encourage. To me that means a 100% hydration AP fed, 12 hour schedule at around 72F. When the starter has been fed this way for a week or so I believe it has been through enough breeding cycles that it is stable. As hansjoakim said, Using a lower inoculation percent should allow a higher pH through out the build, which should deliver more sour. Building a dough using flour with a higher ash content should also help to add to the sour. At least that's my understanding. Wand down. Last night, I re-read Peter Reinhart's instructions for starter maintenance and the SF SD formula in C&C. His "barm" feeding is more liquid than I recalled - 3 parts flour to 4 parts water by weight. Then, this "barm" is used to make a very firm levain which becomes a high percentage of the final dough (92% baker's percentage). I'm going to make this bread this weekend. I may use a smaller inoculation of "barm" in the firm levain than what Reinhart calls for. Susan of San Diego has just found out that her pH is lower (7.4 to 8.6) than San Fran and logically she also mixes her starters with more flour for best results. She uses aprox. the (1:4:6) ratio. Just thought you might want this little tidbit of information. Firstly, since this is my first response to any of your posts, may I just say that I always enjoy checking out your pics of your almost always fabbo bread! This one is no exception - what a crumb! I inevitably have a queue of Shiao-Ping's breads ready to try, but as soon as I saw your pics and read through your description of the finished product I promoted your SF Sourdough with Durum to the front. I had no durum flour, but eager for prompt gratification, I used durum semolina. Not the same loaf, I know, but damn! - the result was very good...one of the most delicious breads I have baked so far. This is a keeper - and I mean with the durum semolina! I'll certainly be trying it with durum wheat flour when I've purchased some, though. A couple of observations. It may have been because I used durum semolina rather than wheat flour, but I found this dough to be too wet (as in, wetter than ciabatta), so I had to adjust the flours up a little. It was still pretty sticky, and although after shaping I retarded it in the fridge overnight in what I use to substitute for bannetons, as soon as the first loaf was off the peel and on to the stone in the oven it spread a lot. The finished loaf rose OK, with a nice open crumb (not as open as yours, however), but it was still a flattish shape. Ditto the second loaf. I can't see from your pic whether your loaves ended up squat as mine did. Just interested to know whether this was the case. I've noticed before with your breads and Shiao-Ping's, that with the wetter doughs you still both manage to get your breads to stand up well in the oven. Mine are not always ciabatta flat like this one was, but they tend to be flatter than yours. Any ideas as to why this may be? My starter is nice and active, but I only feed it once daily, however it froths its discontent. Maybe I am promoting a slightly less energetic starter in exercising this discipline and stinginess regarding feeding time, which I must admit is somewhat reminiscent of a Dickensian orphanage. My dough was rather slack, but it sounds like yours was more so. You might try adding a bit less water next time. However, this kind of dough should have fantastic oven spring (like ciabatta). If it doesn't, the things to consider are inadequate gluten development, not forming a good gluten sheath during shaping and not pre-heating your baking stone enough. OK, thanks David. Think I'm doing the right thing re gluten development and pre-heating, and my shaping does need work...suspect that's the key here. Beautiful breads as always! Regarding the sourness that your breads were lacking, would you think increasing the % of pre-fermented flour in conjunction with a firmer starter and cold retarding might achieve what you desired? Your formula currently calls for 18.5% of pre-fermented flour maintained at 100% hydration. On different occasions, I was able to consistently produce loaves with prominent sour taste by using 20% pre-fermented flour maintained at 50% hydration (3 builds , each at 1:1:2 and between 8-12 hours apart) and long cold retardation at both bulk fermentation and proof (to fit my schedule). The breads were so sour that my husband actually asked me to tone it down. I figure this might be something I should bring to your attention.